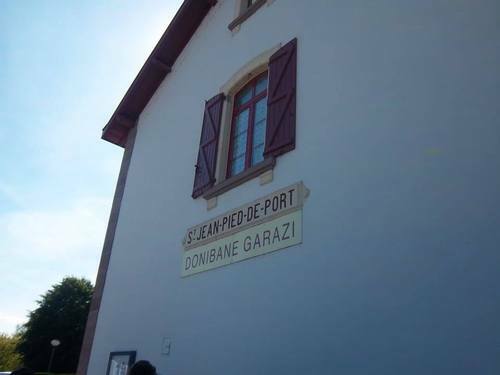 It feels like it’s been so long since Saint Jean Pied de Port, France. Really, it was just September 3rd, it was a Tuesday. We are now in Pamplona. We arrived in France on the Ryanair flight out of Dublin around noon, and after getting into the city of Biarritz, France, on the Coast we took the first 3:05pm train to Saint Jean Pied de Port, the official starting point of the Camino. One lone train car hauled all the Peregrinos from that Ryanair flight into the small medieval town. 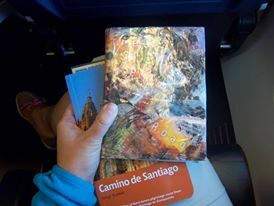 We barreled out of the train car, trekking, proudly strapped into our backpacks in a herd towards a gate to cross a bridge of cobblestone streets. We arrived at a line. The Camino is a line. Everything comes in lines: food, beds, washing machines and even bathrooms. At the registration office where we were to pick up our Camino ‘passports’ we spoke with a Frenchman who barely spoke English. He explained how the coming day’s travel would pan out. 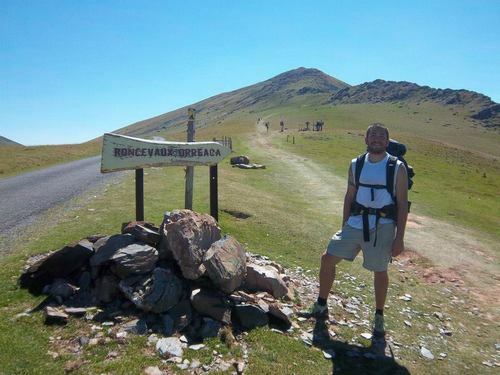 The first day is the most difficult leg of the hike, and one of the longest days, including around 19 miles of strenuous completely uphill hiking. It was nearly 2,700 feet of elevation gain in a bit over six hours. It was brutal, lugging that 14 lb backpack up that hill. That’s coming from the active hiker from Colorado accustomed to hiking at 5,000 feet. Lots of these people are coming from sea level and are not seasoned hikers. We noticed that the average hiker was over the age of 40, an age at which I know aches and pains are already a regular occurrence. The day after our first day to Roncesevalles, my body found a new kind of ache. I could hardly walk, muscles from my hips to my foot arches were tight and I wanted my shoes off so badly that I went after showing, I went to dinner, for the Peregrino’s Dinner, barefoot and in a skirt. No one noticed. It was beautiful, I sat among friends I’d made over the day and we shared a glass of local wine, stories of our day, a basket of bread and some sort of pasta and fish. The next day I could hardly get out of bed. It amazed me how I, fitter than the average person and only 26, was hurting so bad after the first day. People in their 70’s hike this, and with little complaints. You learn to rally on, you learn to put one foot after the other and focus on the basic needs and important things in front of you. You learn to enjoy the company around you. The sun was high and the day was hot while we hiked to Zubiri Spain, in Navarre. It was necessary to stop when we did, at the city with the river although it was only 2pm and we’d been hiking since 7am. I also wanted to enjoy the Camino and not base it on a race to get to each city day by day, although Kent and I do move quite quickly. It was quickly apparent that we would be moving with the same group of people. Tonight in the fanciest one yet, the Albergue Municipal which is called “Jesus y Maria” in Pamplona, there is nearly everyone we’ve become friends with along the Way. Natalie from Pennsylvania, Marika from Hamburg, Lindsey from California, Mark and his girlfriend from Berlin, Brian from Ireland and other Americans and Germans we’ve found along the way and have come to befriend are all here. It is wonderful to have friends you’ve just met, and go out to dinner with them. The Camino is a gathering of people who are all in a strange place in their lives. 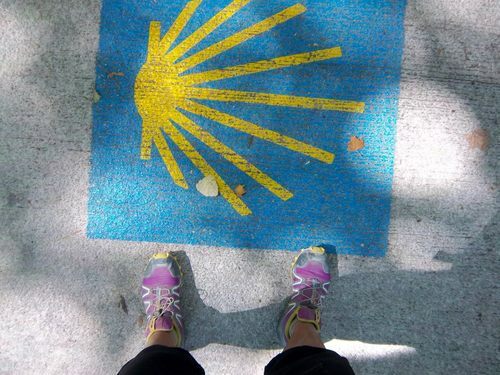 We meet and connect on the same level because we are all lost, and all hoping that the Camino will give us answers. No one walks the Camino for no reason. It is long and strenuous and a test not just of physical fitness, but also of mental fitness. It will test you, and push you, and it will hurt. It seems that after the first two days my body has in fact gotten used to the constant movement, the consistent strain of getting before the sun to be the first Peregrinos out. Today, I’m not tired but refreshed and ready to go! Tomorrow will be a mere 19 kilograms I think, not more than 11 miles, so we may go further. I reached Pamplona with heavy feet. We went at least 1.5 miles out of our way to see a church that was nearly all uphill, and that extra spring in my step was lost there. By the time I got to Pamplona and climbed the cobblestone road and drawbridge into the old city of the Running of the Bulls, I was ready to stop. We made our way through the quiet, old center during siesta. Shops were closed, everything was still, and would remain so until 8pm that evening. Then, the city would to life and tapas and wine would be aplenty and only 2 euro. We’ve walked some 49 miles so far. The hunger for the road grows as you begin to understand your body. Your body adapts to all situations, even when pain is shooting through your legs. We hike down further and further into the warm heart of Spain and I know that I can handle whatever obstacle the Way throws at me, even with my 15 some pound pack. We learn that life is nothing more than putting one foot in front of the other and moving forward, even when it is difficult. People may pass you, and you may pass other people but you continue on at your own pace, you talk with people, you smile.